Compacted graphite iron (CGI) along with lamellar graphite iron and spheroidal graphite iron define the three main classes of cast iron according to morphology. CGI displays very useful properties for a range of engineering applications with the tensile strength and elastic modulus being considerably higher than grey cast irons (75% and 35% respectively). Cast iron is a family of alloys divided into several classes, defined by their graphite morphology and metallic matrix structure. There are mainly three different classes of cast irons classified by their graphite morphology; lamellar graphite iron (LGI), compacted graphite iron (CGI) and spheroidal graphite iron (SGI). LGI, commonly known as gray iron or flake graphite iron has a stable eutectic with graphite shaped as lamellas or flakes, see Figure 2a. In Figure 2c, SGI is illustrated. It is also called ductile iron or nodular cast iron and has a stable eutectic with the graphite shaped as spheroids or nodules. The third class of cast iron is CGI which has a stable eutectic with a worm‐like shaped graphite, also called compacted graphite or vermicular graphite, see Figure 2b. Compacted graphite iron (CGI) can be considered as a promising engineering material which contains graphite particles in compacted (vermicular) form. CGI shows intermediate mechanical and physical properties between grey and ductile irons. For instance, it possesses 70% higher tensile strength, 35% higher elastic modulus and nearly double fatigue strength of grey cast irons. Thus it includes an optimal combination of different properties like strength, ductility and thermal conductivity which have lead to a distinctive attention during recent years. Because of these properties, CGI found a significant role in production of automotive engines, machine parts and also many different applications. Nowadays, several methods of casting of CGI products have been developed, trying to find the best method to have a precise control on the final microstructure. The ISO 16112 international standard for CGI provides for five grades of CGI, ranging from a minimum tensile strength of 300 MPa to 500 MPa (GJV 300 to GJV 500). For each of these grades, the microstructure specification requires a nodularity range of 0-20%. Pearlite content can be chosen to suit the application, with the GJV 300 Grade being fully ferritic and the GJV 500 Grade being fully pearlitic. Flake graphite is inadmissible. As with grey iron and ductile iron, specific alloying elements can be added to enhance high temperature strength, wear resistance or other properties. A full range of heat treatments, including austempering, can also be applied. 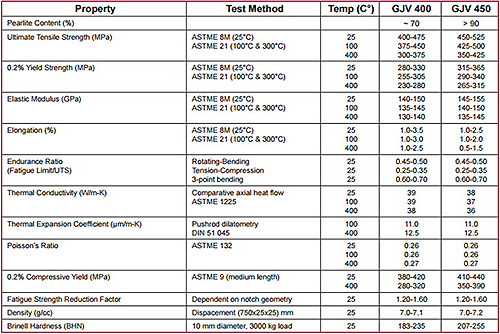 Typical chemistry ranges are provided below, although the chemical specification of CGI castings is subordinate to mechanical properties.